Well it doesn’t chill at all, though it is not as hot as I anticipated. Such a contrast to Egypt…the first thing that changes is the smarm looking for baksheesh. It was probably the single most uncomfortable thing about Egypt, maybe even worse than at home. The gps found us a lovely route to Petra, one part of it was undulating hills with scrub vegetation, flocks of sheep and thistle growing – uncannily akin to Scotland! For the rest it was desert, with a sprinkling of agriculture and industry. Olives and cement. Wadi Musa the little town adjoining Petra is sprawled up and down the hills in muddy brown, quaint and charming. Our hotel is a lovely old one, beautifully maintained and superbly serviced. Sitting out on the terrace and watching the sunset over the hills. Bedouin tea and a really superb dinner buffet. So pleasant after the bad food in Egypt. The hotel is the Amra Palace International Hotel, and I can solidly reccommend it for great cleanliness, helpful charm and very good food. 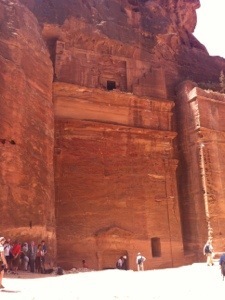 It’s a little distance from the entrance to Petra, but they have 3 shuttle busses morning and evening. The closest hotel to the entrance is the movenpick, which looked rather good too, however I liked the character of the Amra. Tomorrow we go explore the depths of the city in stone. 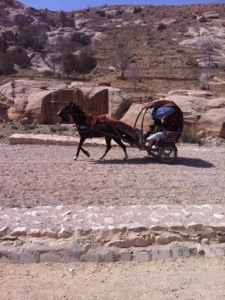 Petra; it starts with a dusty path, alongside the horse track, with the carts and horses throwing up plumes as they come asking if you would like a ride. 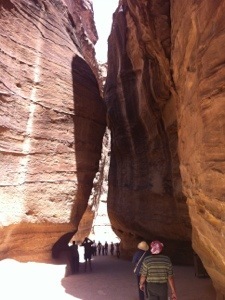 But then you walk into the shady mouth of a narrow canyon. 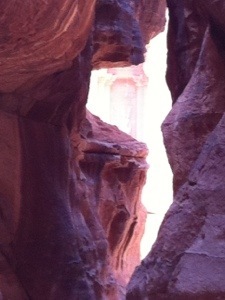 It is the Siq which forms a passage into the main city. Textured pink rock, carved with old water channels either side and various points with icons and deities all weathered in pink stone. There is a saying that this is where Moses smote the earth and water sprang forth. Moses or not, there is a spring and the early Nabateans who built this city controlled the water, channelled it and made reservoirs, creating a perfect stopping point for cross traffic in all directions and earning from their great resource in the desert. 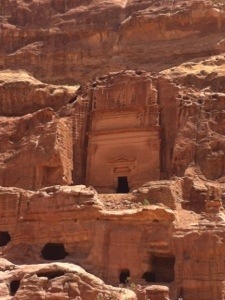 The Siq winds it’s way into the mountains and emerges you at the point where the most famous Petran monument, the Treasury appears. ( Straight out of Indiana Jones, you can imagine Sean Connery and Harrison Ford charging out of the canyon while ‘Petra’ explodes behind them.) Here the valley opens and one has a surfeit of amazing sculpted rock in every direction. 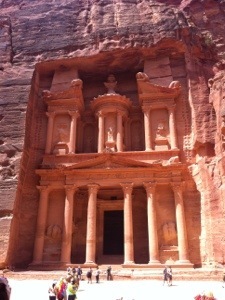 Temples, tombs, cisterns, roman colonnades, a theatre. Crusader castles and the beautiful monastery on the hills. It’s about 12 kms of hot wandering and clambering. Not for the faint hearted. You can take a horse, donkey, camel to do sections, but it is honestly best explored wandering, with a large hat, a camel back water pack and some chocolate for energy. Start early and take the whole day, or take two days. The ticket cost a dinar or two extra over the basic cost, for each day. 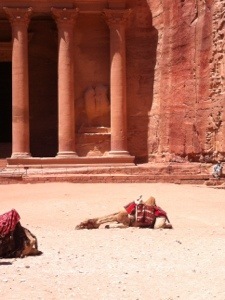 After the hot dusty Petra walk and all that culture and art, the Turkish bath is a must. They steam you and scrub you, pummel and massage all the wellness back in, you emerge; new, refreshed and ready to go back again, however i went and sat on the terrace with an icy beer and watched the sunset. The old ones certainly knew how to build timelessly! 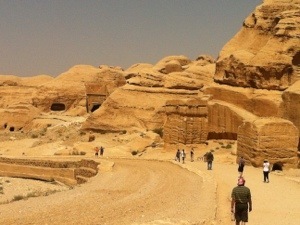 We drove via the Dead Sea and spent a night there on our way back to Amman and the flight out. The Kempinski Ishtar hotel is large and 5 star with its own private beach – so nice. The Ishtar section is nicer to stay in, and the movenpick next door seemed equally nice. The Sea is its own amazing experience of just staying on the surface of the water and barely managing to put your feet down on the ground. Hilarious to start with and wonderfully relaxing once you have the measure. Don’t let it get in your eyes or mouth, stinging and foul. Great for the skin, even if you do not coat yourself with the black mud, smoothens and shines making you gleam. We had a thunderstorm and rain in the desert to add value to an already amazing trip.